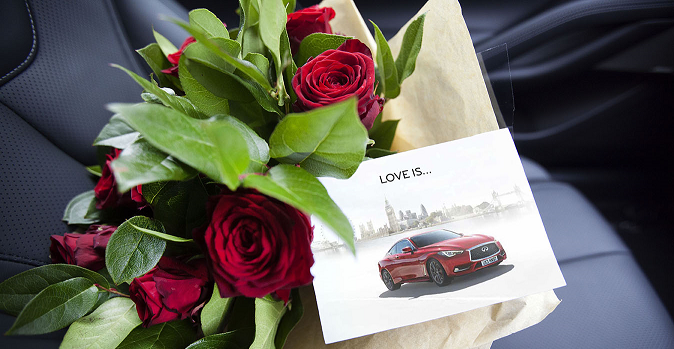 INFINITI, the luxury car maker, is surprising customers in London and the south east this Valentine’s Day with bouquets of flowers delivered to their door. The gesture is part of a Valentine’s Day campaign for the flagship INFINITI Q60 Sports Coupé created by TMW Unlimited. The campaign also features a film that will play out on screens in the Westfield Centre – where INFINITI have a pop-up store – and across INFINITI’S social channels. Created under the banner ‘Love is…in the detail’, the film uses macro shots to draw out parallels between the beautiful detailing in the Q60 and a handcrafted bouquet of roses. We then see the bouquet chauffeured in the INFINITI Q60 to the door of an unsuspecting customer.